A utility vehicle is a heavy-duty vehicle or piece of equipment that is designed for a specific purpose. Utility trucks may come in the form of garbage trucks, water trucks, gas trucks, sewer trucks, sewage trucks, street sweepers, snowplows, cherry pickers, bulldozers, excavators, and asphalt-laying trucks, among others. These large, specially engineered pieces of equipment require a great deal of skill and focus to operate, and their size puts other motor vehicles at a serious disadvantage. Unfortunately, these heavy-duty vehicles are operated all too often by people who are improperly trained, inexperienced, or negligent drivers. Don’t let someone else’s negligence negatively affect your life or livelihood. Call (201) 585-9111 or contact us online to speak with one of our experienced legal representatives today. Your initial consultation is free and confidential, and no fees are due until we win your case. Who Is Liable For a Utility Truck Accident? As with any motor vehicle accident, a utility truck accident comes down to “negligence.” When someone is “negligent,” he or she acted in a careless or thoughtless way that caused harm to another person. Someone can be negligent by doing something they should not have, such as speeding, or by not doing something they should have, such as failing to stop for a red light. They had a duty to do something. In the case of a utility truck accident, the operator had a duty to drive/operate the machinery safely and minimize the risk of injury to others. Legally, anyone who gets behind the wheel has a duty to other drivers to drive in a safe manner; this includes driving at a reasonable speed, keeping a proper lookout for other vehicles and road hazards, maintaining control of the vehicle, and keeping the vehicle in safe working order. They breached that duty. This requires comparing the utility truck operator’s actions to those of a “reasonable person.” Essentially, if someone else were presented with the exact same circumstances, would they have acted differently? Negligent driving activities may include distracted driving, texting while driving, driving under the influence, reckless driving, or speeding. As a direct result, someone was harmed. In order to bring a successful personal injury lawsuit, you must prove that the utility truck operator’s actions directly caused you harm, whether it’s physical injury, property damage, or monetary losses. The best way to determine liability after a utility truck accident is to have an experienced personal injury lawyer investigate the crash. This involves collecting police reports, maintenance records, driving logs, witness statements, medical records, and other relevant documents to paint a complete picture of the accident. Utility truck operators are often required to keep detailed logs of their activities behind the wheel, which can be particularly useful in a personal injury case. Can I File a Personal Injury Claim Against the City? To put it simply, yes. However, there are special rules and time limits that must be followed when a personal injury claim is brought against a governmental body. Most utility trucks are owned and operated by the city, another local municipality, or the state. If this is true for your accident, you must follow a different process. Typically, you have two years from the date of the accident to file a personal injury case in New Jersey. However, if you plan to file a claim against a government agency, you must give formal notice of the claim within 90 days of the accident. After filing the initial notice, you must wait six months to file a lawsuit. During this time, a legal representative for the city/town/state will most likely contact you to try and resolve your claim. With the help of a New Jersey personal injury lawyer, you can decide whether or not to accept a settlement offer and resolve your claim. If the government does not offer a fair settlement (or if no effort is made to resolve your claim), you can choose to file a formal personal injury claim. Keep in mind that, regardless of what kind of personal injury case it is, New Jersey law requires you to file your claim within two years of the accident. If you do not bring your lawsuit within this time frame, New Jersey courts will refuse to hear your case. 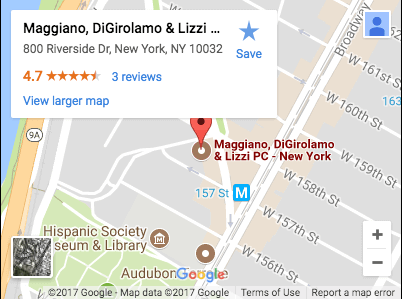 If you or a loved one have been injured in an accident involving a utility truck, Maggiano, DiGirolamo & Lizzi are here to help you recover your losses. Our personal injury lawyers have more than 80 years’ worth of experience fighting for the injured, and we are committed to holding the guilty party accountable for their negligence. We have the tools, experience, and resources to stand up to municipalities and their legal teams—both in and out of court. Call Maggiano, DiGirolamo & Lizzi at (201) 585-9111 or contact us online to speak with one of our experienced utility truck accident lawyers.